Skunks are omnivorous animals that live off of human waste. Though harmless, you should get rid of them without getting close to them or you will risk being bitten or even get a dose of their harmful spray which can cause great discomfort to animals and human eyes. Skunks are scavengers and they eat anything nutritious they find on their path. If you have trees that produce berries, crabapples, nuts or any other fruits, clean them regularly by raking the yard as often as you can. You should also discard other vegetation like piles of grass as they may contain seeds and other sources of foods for skunks. Place a tray under bird feeders to collect falling feeds and clean up any stray seeds on your yard. Ripe fruits and vegetables are another major attraction of skunks. Therefore, you should surround your crops with a low fence as skunks cannot climb over but they can dig under the fence. You can consider burying the fence some inches below or sprinkle chili powder or cayenne around the fence perimeter to keep skunks away. Also harvest the ripe vegetables and fruits from your garden as soon as they are ripe to prevent the skunks from feeding on them. Skunks survive on garbage, therefore, it is important to keep the trash can sealed properly. You can get a locking garbage from local home improvement stores in your area. You can also consider storing your garbage in the garage or in a shed at night so that its smell does not attract skunks. Skunks are nocturnal creatures and they do not like bright light. Lighting your yard in the night will scare skunks away but you risk attracting insects that love light such as moths and crickets. Since you will shine light on the yard all night long, use energy saving bulbs or solar lighting to save on energy and avoid paying high electrical bills. Also, you can use a motion sensor that is tripped when any creature comes close to it. This way, the lights do not have to stay on all night as the skunk has to step on the sensor for it to light. · Dog and fox urine. If you are unable to collect dog urine, you can buy products containing dog or fox urine from a hardware store and spray it around the yard. · Pepper spray also repels skunks and other wild creatures such as squirrels. · Citrus peels repels skunks naturally. Scatter either lemon or orange peels in your yard especially in areas where you suspect skunks spend time. 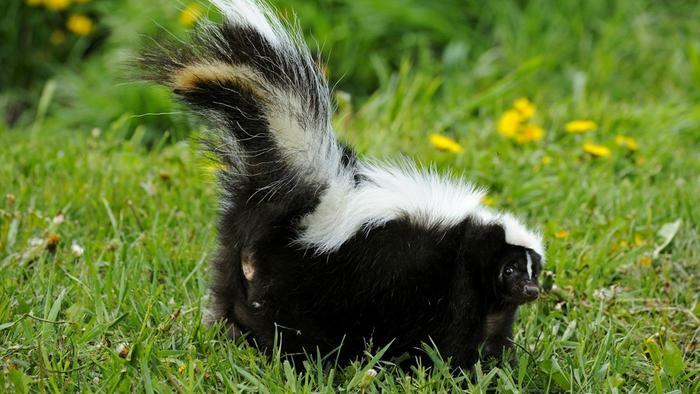 · Ammonia; soak cotton balls in ammonia and place them in your yard to keep skunks away. If you use ammonia or mothballs, keep them far from children. These sprinkles turn on automatically when there is any motion too close to them. They are a natural and safe way to get rid of skunks. Place them in areas you suspect skunks shelter. Skunks mostly reside in sheltered areas, under porches and decks. Close off these spaces using a fence, rocks or plywood. Piles of building materials, lumber can also serve as shelter for skunks. You should store such materials in a bin or shed to prevent skunks from residing there. Also, clear low vegetation or large bushes as they act as skunks hiding places. If the skunks are persistent to leave your yard, contact an animal control center in your area to help you take care of the removal. They have special tools to trap and release skunks away from your yard.